The End is a stylish looking bar and restaurant on Thong Nai Pan Yai beach in front of Candlehut Resort. The publicity photos showing this long ellipsis of wooden decking on the beach with orange bean bags make the bar / restaurant look impressive. Sadly, looks can be deceptive. Early reports suggest both the food and the service are lousy. Candlehut Resort in Yai has some better quality bungalows on the beach. They have moved away from the original backpacker style of Koh Phangan and offer a more boutique experience. However, over the years the accommodation has started to look somewhat shabby. The difference between the stunning publicity photos of the bungalows and the reality is marked. The same point could be made of The End Beach Bar and Restaurant: the sales photos of the place make it look better than it really is. The main complaints about The End concern the staff that are inattentive and unfriendly, and the food which is not very good for the money. The food takes a long time to come out and when it does it is disappointing. The calamari is too rubbery; the Caesar salad has far too much cream and not enough chicken or lettuce; and the Thai chicken with cashew nuts has no real Thai spicy taste to it. All this is a shame because The End has a great location with the sea in front and the mountains behind. The bean bag seating is cool and there is a water feature with blue lighting that has a funky effect at night. The End Beach Bar and Restaurant could be so much better than it actually is. No doubt its cool appearance and prime location will pull in plenty of first time punters. It is also not to be doubted that few will return. I suspect that when TA (that over-rated corporate site) eventually pulls in reviews about The End the management might start to care a bit more about the service and food at the new Candlehut bar. Until then stay away. Last year Dolphin Bungalows on Yai shut down their restaurant. When they did so the people who had been running the place decided to branch off and start their own restaurant. After a hectic few months of building Giat and Kim opened the new Dolphin Bar and Café. 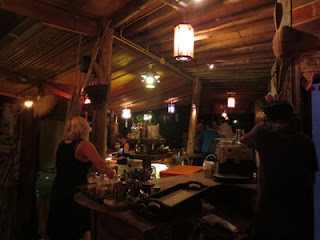 The restaurant / bar is located by Thai Terrace on one of the roads leading down to the beach. 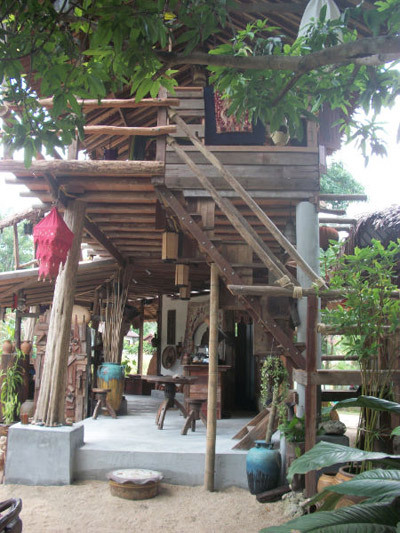 It is a 2 story building using local and natural materials. There are plenty of interesting Asian artifacts to look at and several inviting eating and drinking areas. Upstairs there are jungle views and outside there are views over a pond. The official opening party was held on February 15th, 2013. Despite missing the hoped-for Christmas opening the party was a great success. Lots of people turned out and the festivities went on to the wee hours of the morning. For the party chicken cooked in large earthen ware dragon pots was served along with many other Dolphin faves. Dolphin Bar and Café is now fully open. It won’t be long before all their friends from their Dolphin Bungalows days find the new restaurant. They won’t be disappointed: the new menu has fresh salads, pasta, homemade bread sandwiches, tapas, real coffee and healthy breakfasts. It is a beautiful spot with a cool building and landscaped garden. The Dolphin Bar and Café makes a great spot to enjoy a few drinks. Future planned events include a ‘chilled’ party night and food nights such as baked pork rib specials. It won’t be very long before the new Dolphin Bar and Café becomes an entity in itself. At present people are apt to get confused with a Dolphin Bar on the beach and a Dolphin Bar just off the beach. The names are the similar but not the experience.